Recipe inventing comes naturally to me … I am constantly thinking of new combinations in my head. Sometimes, I challenge myself to make an exciting dish out of what’s already in my kitchen/garden. I also don’t have much time, so I usually come up with these ideas when I’m at school or work … I jot a few things down, use some of the cooking techniques I’m familiar with, and then throw in a new twist. Here’s yet another one of those concoctions … I wasn’t sure about it at first, but it turned out splendid and it got the stamp of approval from my Sweetie. 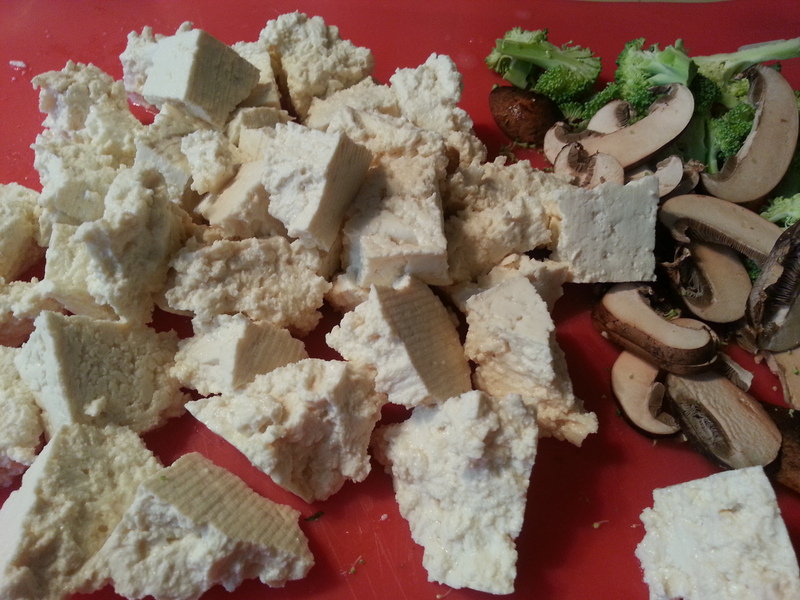 8 ounces of tofu, thinly sliced. 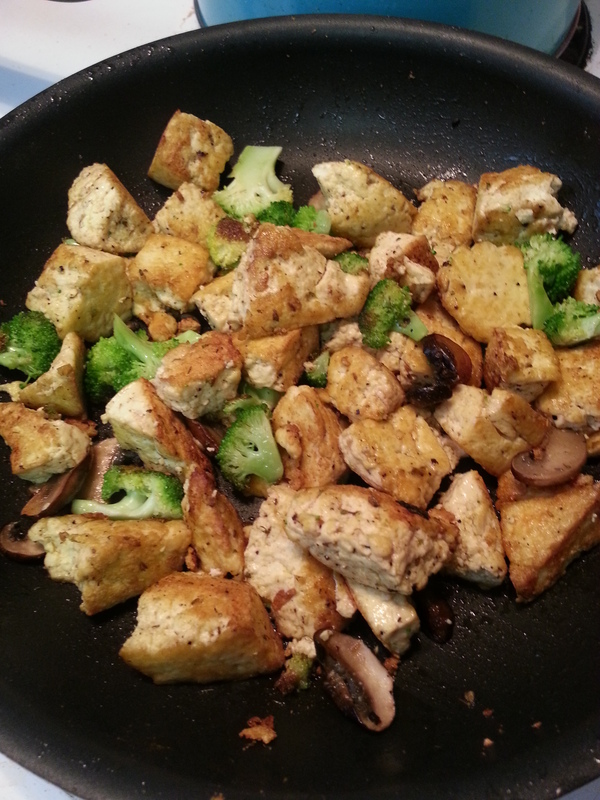 Saute` tofu over medium heat until crisp, season with salt and pepper, remove from pan and place into a bowl until later. 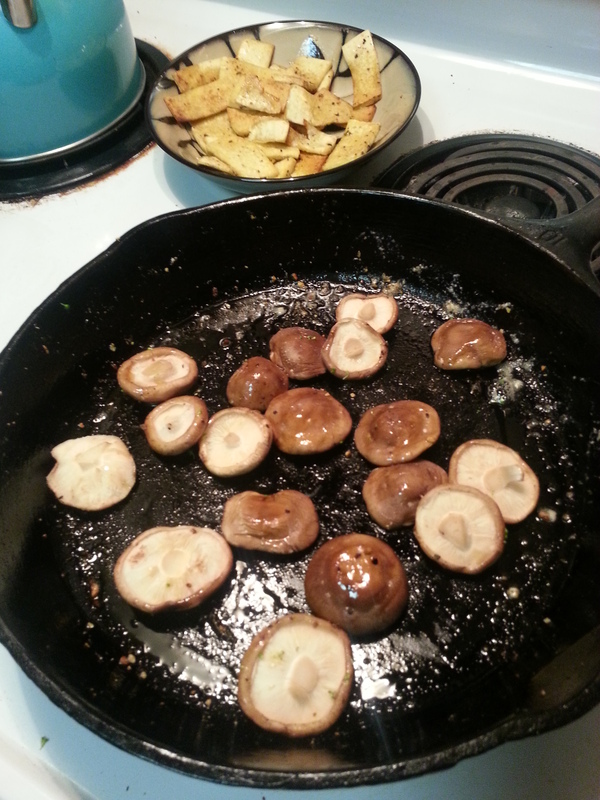 Saute` mushroom caps until brown, season with salt a pepper, remove from pan and place in bowl with tofu. 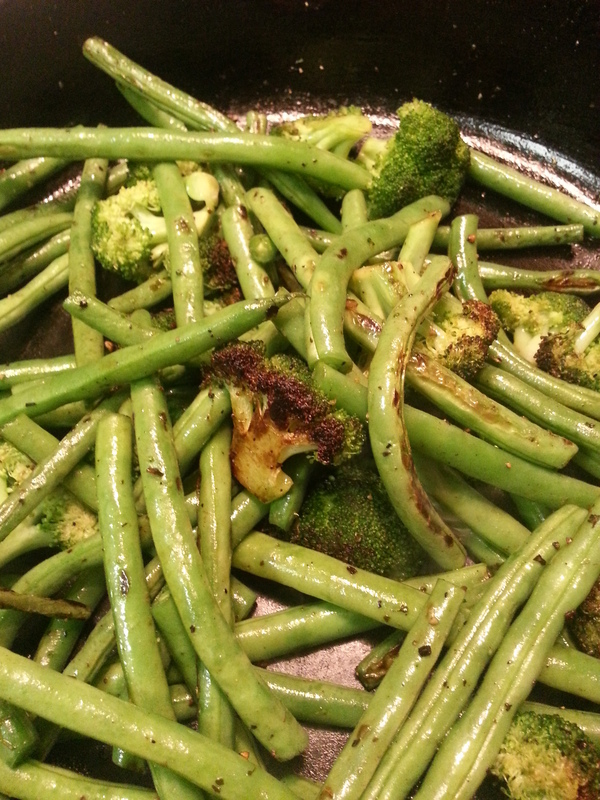 Turn up the heat to medium-high and add the green beans and broccoli and char. Season with salt and pepper. This will cook the vegetables slightly while giving them a nice smoky flavor. 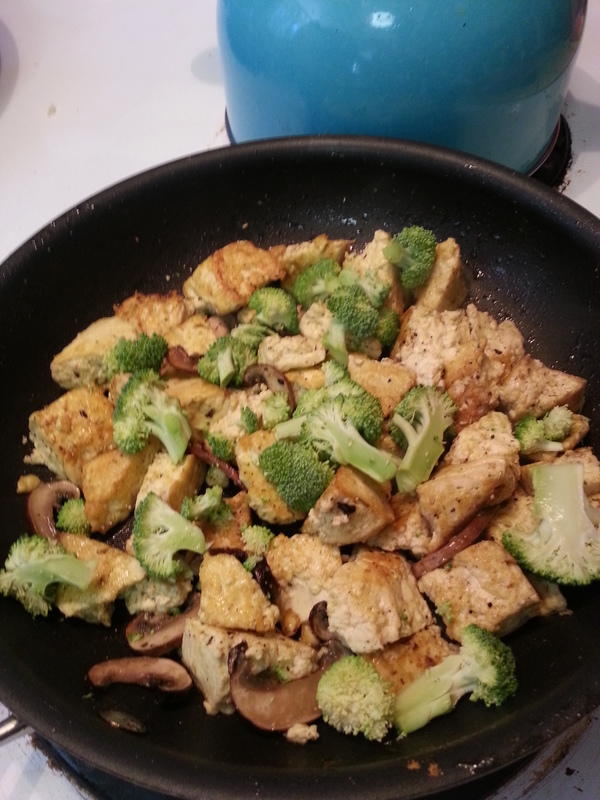 Now push the vegetables to one side of the pan and add the tofu and mushrooms back to the pan to warm them through. To plate: Place a large scoop or two of vegetables to a bowl. 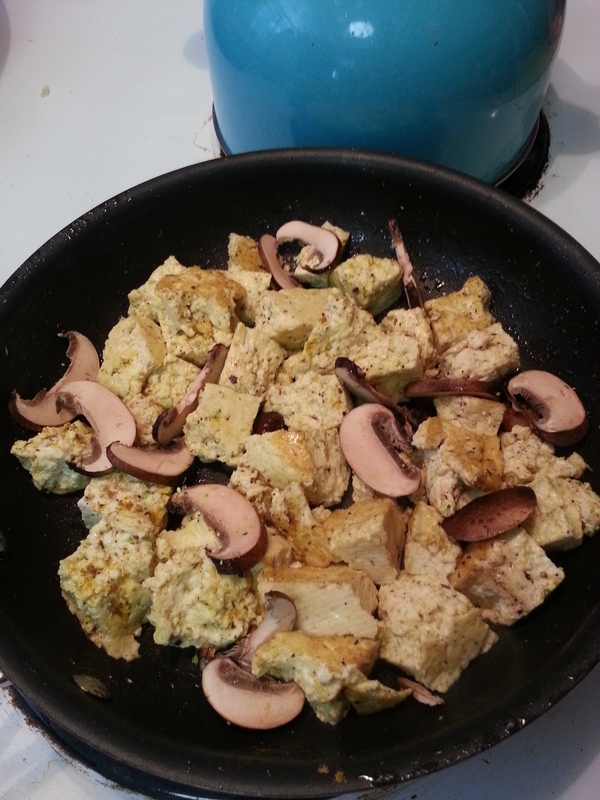 Then put down a layer of mushroom, top with the tofu and then sprinkle on the blue cheese. 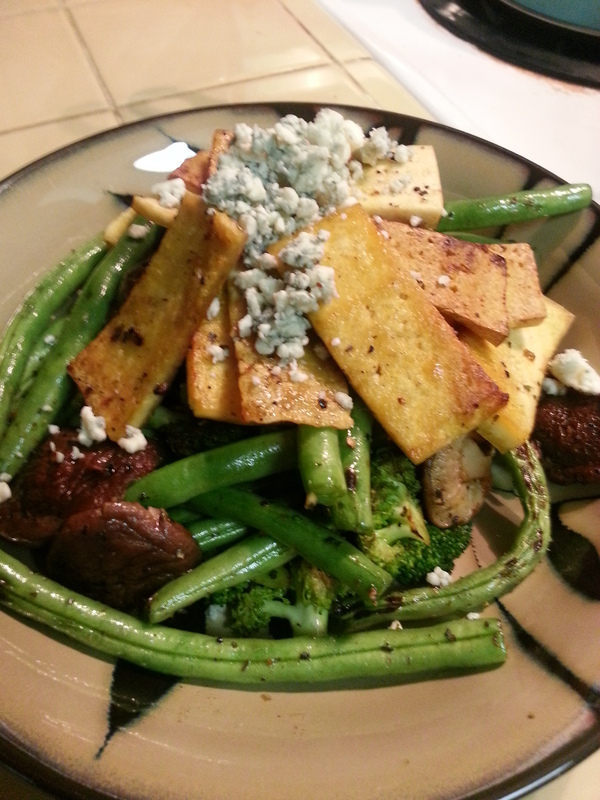 The blue cheese gives a nice creamy element to the crisp veggies and tofu while adding a nice punch of flavor to the dish. Please let me know what you think in the comments section. I always love hearing feedback. Okay, I know what you might be thinking … “tofu scramble sounds so gross!” Others may be thinking that this sounds incredibly yummy. Still, others might just be curious to see what the heck I’m talking about. I encourage everyone to keep reading. There is delicious food to be had! Now, please forgive me in advance, I am of Italian descent so I do not measure anything when I’m cooking. I will give you my best approximation of how much I used of each ingredient. Ready or not … here we go! Warm skillet with butter (or oil) on medium to medium high. Drain your tofu. 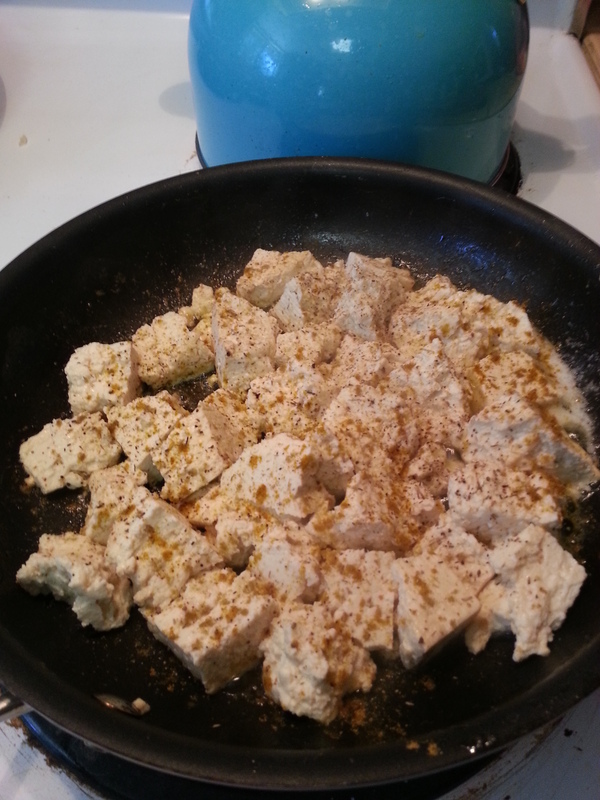 I like to tear my tofu to give it a better texture when cooking (so it sort of looks like scrambled eggs) but you can cut it into bite size pieces. Slice up your veggies and set those to the side. Tofu tends to be wet, so be careful when adding it to your pan so you don’t splatter yourself with hot cooking oil (I have scars from this). Start frying your tofu. It takes a little while to get it browned up. I like mine a little crispy so be sure to let it cook for a bit before you stir it. If you stir it too often, it won’t get brown and crispy. 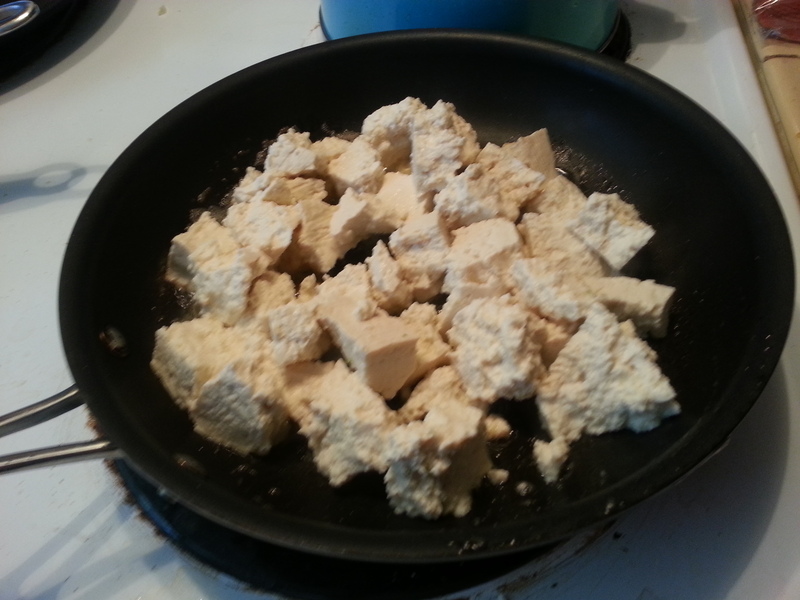 Cooking tofu take practice and patience, so don’t be discouraged if it turns out chewy or hard on your first try. 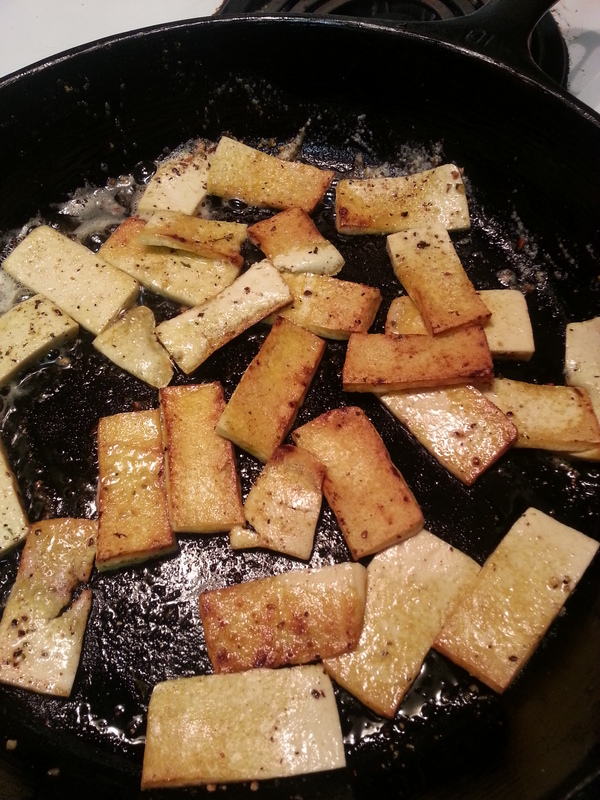 Also, if you find that your tofu looks like its taking a bath in the skillet rather than frying, simply scoop the tofu out, drain the pan, wipe dry, add more butter or oil and keep cooking. Now, get out those spices! 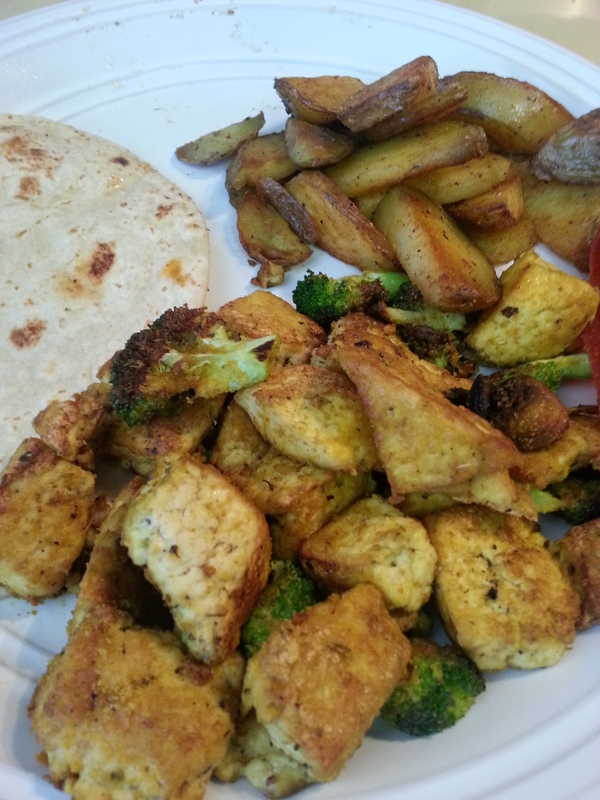 But not the nutritional yeast … we will add that at the end. Sprinkle your spices on. Remember to add or more or less depending on your taste. I ended up up adding a lot more of the spices, but I love the flavors. Start with a small amount and build to your liking. Next, add your veggies. I added my mushrooms first since they take a little more time to cook. Once the mushrooms are browned it’s broccoli time! Your tofu and mushrooms should be getting brown at this point. I like my broccoli a little crunchy, so I don’t cook it very long. 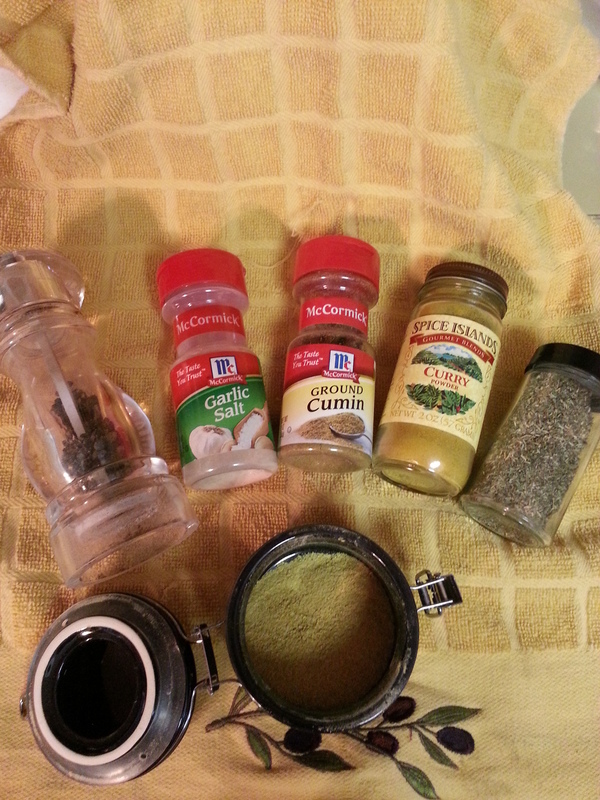 This is what mine looks like right before I add the nutritional yeast. Time to sprinkle on the nutritional yeast. 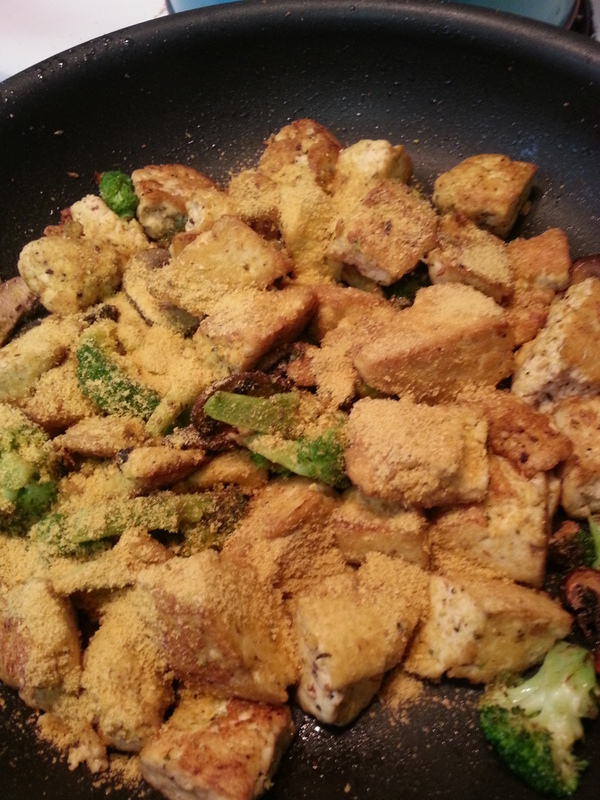 Stir to coat the tofu and vegetables in the yeast and serve with your favorite sides. As for me, I like mine with skillet potatoes, vegetarian bacon, and tortillas. Now go enjoy the delicious tofu scramble you just made! Please comment below with any questions or if you have any suggestions for other recipes you would like to see. I would love to know your ideas.